Page of Pentacles: “Opportunity slumbers like the dragon upon whose crest the Page of Pentacles rests. Dreams and visions vibrate along its emerald length. They rise up through the soles of the feet of any who tread upon that viridian path, transmitted from the leviathan’s sleeping mind – dreams of success and of being able to possess material comfort and stability. She knows those visions that the dragon offers – a wondrous garden of delights. She is the keeper of that garden, dedicated to it’s preservation. 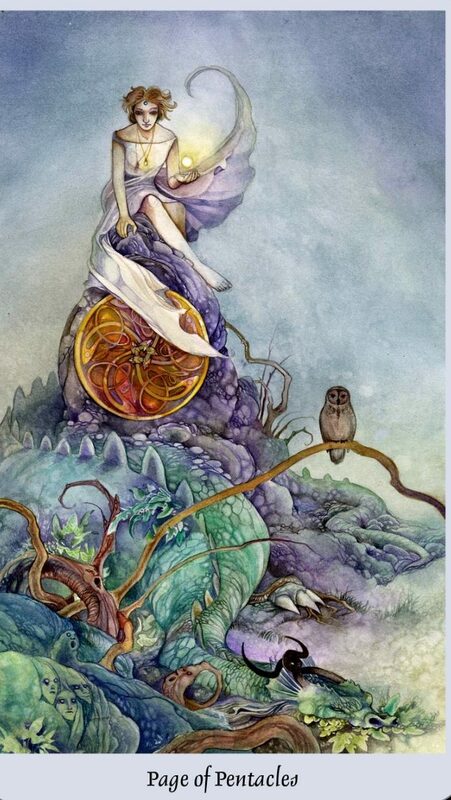 The Page of Pentacles comes bearing her message for opportunities of growth and prosperity. It is a small spark she holds, but she is just the harbinger for potential. Make of that spark what you will – a mere smoldering coal or the blaze of a rising star – but that choice and vision is something that each individual must find on their won, using the skills and resources at hand. Just as the sleeping dragon is dreaming the dreams of possibility, we can use our vision and our imagination to dream our creations into reality. It may not seem like a powerful tool, but it is just as powerful as the dragon is upon waking; upon taking flight. Perched above the dragon is the owl, symbol of magic, mystery and intuition. The Faery folk watch in awe from a careful distance, knowing the full power of the dragon could be awoken at any moment. Opportunity can be subtle, an invitation to explore the realms beyond your comfort zone; a dream starting to form around the edges of your conscious mind. Maybe it comes looking exactly like something that scares you, makes you cringe… yet if you took it in small consistent steps it would be easier than you think. Maybe it is something that does not at first seem like an opportunity; you don’t feel like going, you have other plans, you want to stay home and go to bed with a good book. No more hiding your head in the sand. Know that dedication and commitment are key here. What do you want to create in your reality? Where are your thoughts, feelings and intentions focused? What do you believe is possible? Have more than a mustard seed of faith in yourself and this process. Know that your limitations are but illusions; that which seems insurmountable is actually just smoke and mirrors. It is time to awaken the dragon. Time to start bringing hopes and dreams to life, awaken the dragon.